Speaking on the situation in Syria, Erdogan's administration said that stressed that "both countries share stance on the issues of Syria’s territorial integrity and anti-terror fight"
Ankara and Moscow are discussing a broad range of issues of cooperation in defense sector, including contracts on supplies and joint production, Fahrettin Altun, the Turkish president’s communications director, wrote on Twitter on Monday. "We are holding a broad discussion with Russia on our cooperation in defense sector. We are discussing the issues ranging from mutual supplies of military equipment to possible joint production. 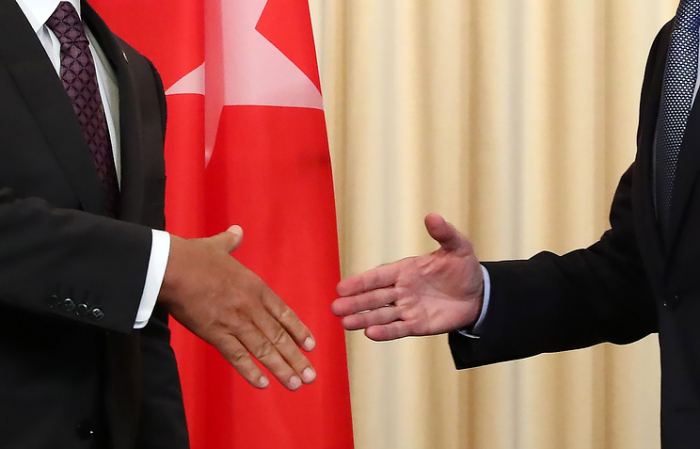 Bilateral cooperation in the defense area is of a large scope and continues developing," Altun said ahead of a meeting in Moscow on Monday between Turkish and Russian Presidents, Recep Tayyip Erdogan and Vladimir Putin. Speaking on the situation in Syria, Altun stressed that "both countries share stance on the issues of Syria’s territorial integrity and anti-terror fight." "We are calling on all countries supporting terrorists, which threaten Syria’s integrity, to stop this and make their contribution [to the settlement]," he wrote. On Monday, Erdogan and Putin will take part in the eighth session of the Russian-Turkish High-Level Cooperation Council. The talks will focus on Syria, Russia’s supplies of S-400 missile systems to Turkey, the implementation of the TurkStream gas pipeline and other vital issues. The issue on a contract on the S-400 supplies has become a pressing problem in Turkish-US relations. The United States demands that Ankara should give up the deal and choose either the S-400 or NATO. Turkey insists that it can decide independently on purchasing armaments from any country, and the issue with the S-400 is a closed chapter and will be implemented. The S-400 ‘Triumf’ is the most advanced long-range air defense missile system that went into service in Russia in 2007. It is designed to destroy aircraft, cruise and ballistic missiles, including medium-range missiles, and can also be used against ground installations.